Pantry Slides, 18" to 44", 175lbs. to 450lbs. Fulterer FR 775 and FR 777 Pantry slides are generally used in pantry or other slide-out shelving applications. The weight of the pantry/shelving system rests on the floor of the cabinet. Weight capacity of pantry slides range from 175 lbs for smaller pull-out applications up to 450 lbs for more substantial pullout shelving units. These shelving units typically are constructed using a lower, weight bearing slide as well as an upper slide used for aligning the top of the shelving system. Fulterer FR 775 and FR 777 Pantry slides are generally used in pantry or other slide-out shelving applications. The weight of the pantry/shelving system rests on the floor of the cabinet. Weight capacity of pantry slides range from 175 lbs for smaller pull-out applications up to 450 lbs for more substantial pullout shelving units.These shelving units typically are constructed using a lower, weight bearing slide as well as an upper slide used for aligning the top of the shelving system. 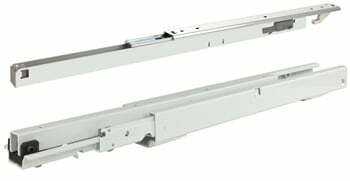 Fulterer Pantry Slides are available with their patented (ECD) easy close device which allows the unit to close softly keeping the stored items from possibly tipping over when closing. While it is possible to use traditional ball bearing drawer slides for pull-out shelving, the Fulterer Pantry Slides are specifically designed for this purpose and are significantly more reliable delivering longer life of your slides and better results with your pull-out pantry or shelving unit. The Fulterer FR777, Heavy Duty 18" Pantry Slide, makes for an easy installation of a custom roll out pantry. The FR 777 model is designed for large full height pantry pull-outs, up to 450 lbs. Optional Soft Close available. The Fulterer FR775 ECD, 18" Pantry Slide, makes for an easy installation of a custom roll out pantry. The FR 775 model is designed for pantry pull-outs less than 59 inches tall, and up to 200 lbs. For kitchen base cabinets. The Fulterer FR777, Heavy Duty 20" Pantry Slide, makes for an easy installation of a custom roll out pantry. The FR 777 model is designed for large full height pantry pull-outs, up to 450 lbs. Optional Soft Close available. The Fulterer FR775 ECD, 20" Pantry Slide, makes for an easy installation of a custom roll out pantry. The FR 775 model is designed for pantry pull-outs less than 59 inches tall, and up to 200 lbs. For kitchen base cabinets. The Fulterer FR777, Heavy Duty 22" Pantry Slide, makes for an easy installation of a custom roll out pantry. The FR 777 model is designed for large full height pantry pull-outs, up to 450 lbs. Optional Soft Close available. The Fulterer FR775 ECD, 22" Pantry Slide, makes for an easy installation of a custom roll out pantry. The FR 775 model is designed for pantry pull-outs less than 59 inches tall, and up to 200 lbs. For kitchen base cabinets. The Fulterer FR777 Easy Close Device, soft close accessory. The Fulterer FR777, Heavy Duty 26" Pantry Slide, makes for an easy installation of a custom roll out pantry. The FR 777 model is designed for large full height pantry pull-outs, up to 450 lbs. Optional Soft Close available. The Fulterer FR777, Heavy Duty 28" Pantry Slide, makes for an easy installation of a custom roll out pantry. The FR 777 model is designed for large full height pantry pull-outs, up to 450 lbs. Optional Soft Close available.